GP Trailers are offered with three tyre options and larger models are also available as tri-axle versions. GP models are fitted with a tough resin-coated plywood platform. Various options are also available including factory fitted aluminium treadplate floor covering, bolt on ramp knife edge and 1.8m/6’ skids or ramp in place of the standard size of 1.2m/4’. 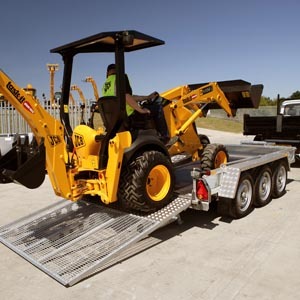 All our plant trailer models are fitted with integrated ramp or skid supports. This standard feature ensures trailers are supported whilst being loaded without the need to deploy prop stands. Low sided models are offered with either open or closed sides and have a bucket rest fitted as standard. High sided models come with filled in sides and an optional bucket rest. This option is ideally suited to users who require flexible usage from their trailer; a reliable plant trailer providing additional depth for use as a general duty trailer.